A year ago, I was elected as a Trustee to the West Vancouver Board of Education and it’s been an honour to work on behalf of this community. I’ve lived most of my life here, I’m a graduate of the school district in which I now play a role, and I’m fortunate I’m able to raise my child here. 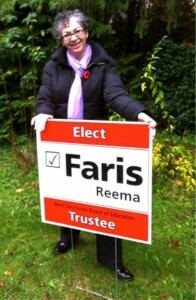 As a public education community, we’re very lucky in West Vancouver. We have a great administrative team, we have inspiring leadership from our Superintendent, we have incredible staff, we have a caring Board, and we have a cadre of educators who are diligent, dedicated, and determined to deliver the highest quality teaching and learning. We’re also favoured in that our community highly values education and families here generally have the means to ensure the best for their children. And yet, even with all these advantages, I see any number of troubling issues which appear to characterize the public education system in British Columbia. And so, when I’m asked about my experience as a Trustee, my inclination is to say that the system is more complex and complicated than I realized despite having been an active parent-volunteer for five years before choosing to run for office. In part, I think, because there are many different interpretations of the generally agreed upon underlying principle which I see as “the best interest of the child”. Is the core purpose of education the success of the individual child or is it the betterment of society? Do parents know what’s best for their child or do teachers? Is an educator an autonomous professional or an expert member of a team? I’m sure any one of us could generate an endless list of questions on the big picture of education, but then there are the practicalities. How is the provincial government able to show that funding per pupil is at an all time high while school districts have to nip, tuck, or cut programs and services in order to balance budgets? Given that 80% of a school district’s budget is consumed by salaries and benefits, how can innovative projects be implemented when resources are so constrained? How can infrastructure be maintained and new capital projects be contemplated with no additional funding? Despite the seemingly intractable challenges, there’s no doubt in my mind that we have to do everything we can to foster dialogue on this issue. That education needs to be made the highest priority in this province, that we have to find a way to work collaboratively to make our strong system better. The reason is simple. Education is the path to a more just and more equitable world. And while it may be difficult to hold on to this truth given the evidence of the harm humans continue to do to the earth and to each other, it is why I remain committed to doing the best I can, for public education, in the remaining two years of my term.